When #4 daughter (now a soon-to-be-published author) was wee, she was a big fan of pitty flahrs. If you speak weeish, you know that means pretty flowers. I’m very partial to them, too, and always look forward to spring, in part for their sake. Or sakes, if you prefer. First come the snowdrops, but they’re aptly named. When the snowdrops bloom, you still have two freakin’ months of winter comin’ atya. THESE are the guys I really look forward to. 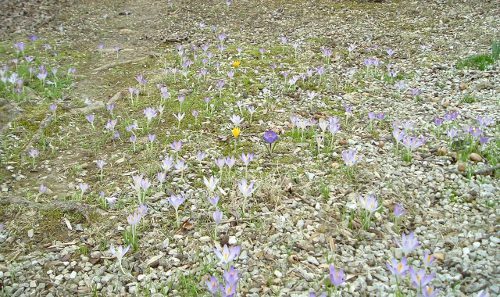 Yes, it may still frost, it may still freeze, it may still snow, but spring is really just around the corner when crocuses (croci?) bloom. Aren’t they beautiful? They make me so happy! We have a bazillion little tiny baby ones, too, spreading around like weeds. They, too, make me very happy. I’m posting today at Fatal Foodies about something else that makes me happy: my friend Carol Preflatish’s book A KITCHEN AFFAIR. A WRITING PROMPT FOR YOU: What makes you feel that Spring is really, truly, actually just around the corner? This entry was posted in Grab bag, Sparks o' Joy. Tagged country life, flowers, MomGoth's Sparks o' Joy, photographs. When the mornings start getting here earlier and faster and earlier. Even if it’s not sunny, you just KNOW the days are getting longer. Oh, and BY THE WAY!!! Give it up about your #4’s book already!!!!!!!!! Marian Allen would love to share..Guess Who’s IN PRINT?